Yesterday I was wanting to read the Bible, but I was struggling for where to turn. The word steadfast came to my mind. As I was looking through the Bible and my Concordance for where the word ‘steadfast’ showed up in the Bible I found that almost every place where ‘steadfast’ was had already been underlined at one point or another in the past. It’s not that I had done this same exercise in the past and underlined or highlighted them on purpose, but those are the verses that have spoken to me throughout the years over and over again. As I was reading through the verses I realized something—if there was one thing that I could credit (other than my relationship with God) for the positive changes that I have experienced in my life over the past 8 years it would all come down to the word ‘steadfast’. I think this is a word that many people never think about. It’s not a word that you hear very often in daily conversation. When I was talking to my husband about this yesterday he thought it was probably one of the most boring words in our language (it’s funny how different things speak to different people). But, I couldn’t disagree more! The Merriam-Webster website defines steadfast as “firmly fixed in place, not subject to change, firm in belief, determination, or adherence.” When I reached the point of life where I knew there were many things that needed to change about me, like the way I behaved and thought, and went through the process of really finding myself, it all happened because I was steadfast. In my own words, I would describe being steadfast as being determined to accomplish something no matter what happens. When I hit this point in my life I was determined to make the changes that I needed to make and it didn’t matter what anyone else said. I studied the Bible and many different books to figure out the woman and wife that I wanted to be. I made a list of character traits that I wanted to have in my life. Then, it became my focus to develop these in my life. Here are just a few of the verses that were in the Bible that used the word ‘steadfast’. Today I was at an open gymnastics play time with my daughters. There was a young girl who I would guess was probably around six-years-old that was practicing on the uneven bars. She would spin herself up until she was standing on top of the lower bar and then she was trying to jump and leap to the higher bar. She couldn’t make it. But, she tried over and over and over again. I watched her try it for nearly an hour and I think she was still at it when we decided to leave. She never looked disheartened. Every time she jumped for it, she came up short, missed, and fell to the ground. But, every time she got up and went right back to it. This is what you have to do to make changes in your life. You have to be steadfast in your heart and your mind. When you determine that there’s something that you want to change in your life you need to become steadfast towards it. You need to go after it with everything that you have the same way that little girl kept jumping for that higher bar over and over again. If it is something that you have determined is a change that you should make in your life, and will make a positive difference in your life, then you should not let anything get in your way. You need to fix your mind on it and keep after it. I am not perfect at applying this to my life all the time. But, the times that I have applied it to my life are the times when I have really experienced the changes that I wanted. When you are steadfast you don’t waste time crying, you don’t waste time complaining, you don’t waste time making excuses. All of these things are a waste of time—keep reading, don’t hate me for saying that. I’m not saying that crying is bad or that it’s something that you should never do. Ask my husband, I’m a crier. I believe there are some times when that is truly the natural reaction and that it’s the right reaction for some situations, like pain and death or sorrow and grief. But, crying does not change situations. So, there comes a time when the tears need to stop and the action needs to start. And, I have found in my own life I usually have to consciously make this decision or else I will stick with crying for far too long. I want to challenge you today to choose the area of your life that you know you want to make a change in. It’s that area that you have wanted to see a difference in for a long time, but you’ve always made excuses for it in the past. I’m challenging you today to become steadfast in seeing improvement in your life. No one can make it happen but you. The actions that you take today, tomorrow, and the day after that are all going to play a role in you reaching the end goal that you are looking for. 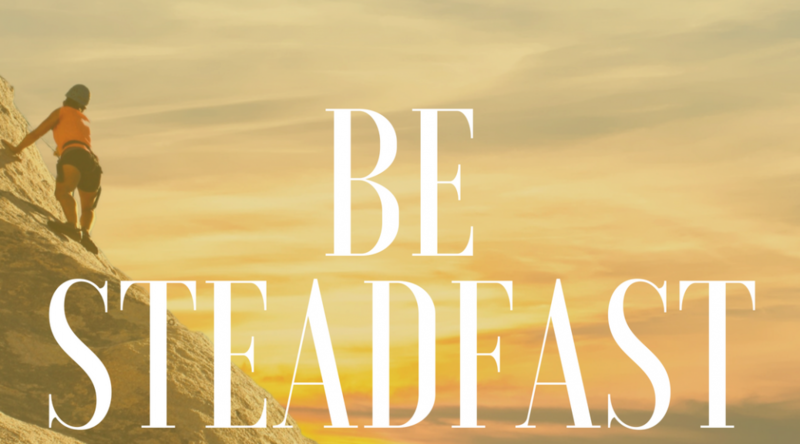 Be steadfast in your mind and steadfast in your heart. Right now I have a FREE Facebook challenge group set up for women that have a specific goal they are working towards. The group is to help each person stay accountable by giving you a place to report to others on your progress. It’s also a place where you can get encouragement and help encourage others. We are celebrating successes together along the way and encouraging each other after bad days. If you are ready to be steadfast in seeing changes in your life, come on over and join us! Hi Stephanie! You’re right. Steadfast is not a word we hear every day. Odd how it says firmly fixed in place and not subject to change, yet it’s something that allows change.